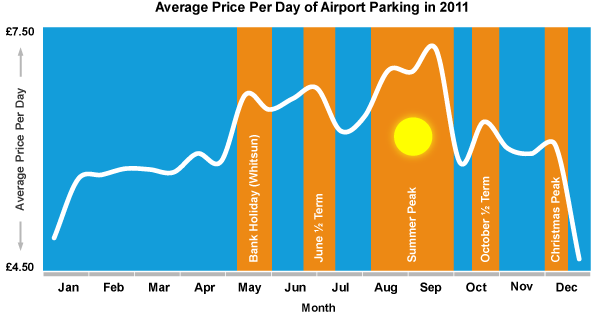 Typically parking prices increase as the car parks fill up, which is why you should book early to enjoy the lowest prices. The daily rate you are charged at is influenced by the total duration of your booking. That's why a booking for 2 weeks has a cheaper daily rate than a parking booking for 1 week. 1 week parking at £25 or £3.50 per day or 2 weeks parking at £40 = £2.80 per day*. Parking bookings made during busy periods such as school holidays or public holidays like Christmas and Easter are usually more expensive. 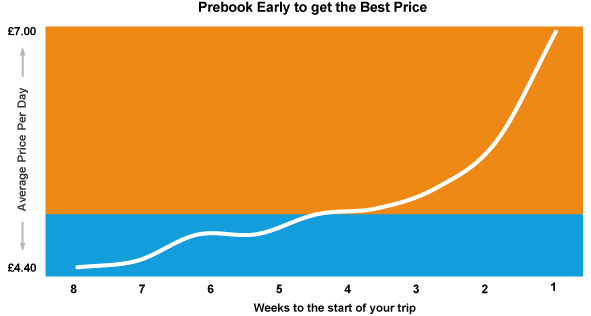 The moral of the story is that in order to ensure you get the lowest prices available you need to; pre-book early and avoid travelling during busy periods.